Calculate the area under the tree's canopy or drip line, which is the farthest point from where water drips off the leaves. Put on garden gloves and measure out one half pound of slow release fertilizer for every 500 feet of area. Sprinkle the fertlizer under the tree, taking care to cover the entire surface under the drip line evenly and thoroughly. Avoid fertilizing directly up against the trunk; leave about six inches to one foot of ground between trunk and fertilizer. Water thoroughly so that fertilizer sinks into the ground, where it can be absorbed by the roots, which tend to stretch out as far as the drip line. 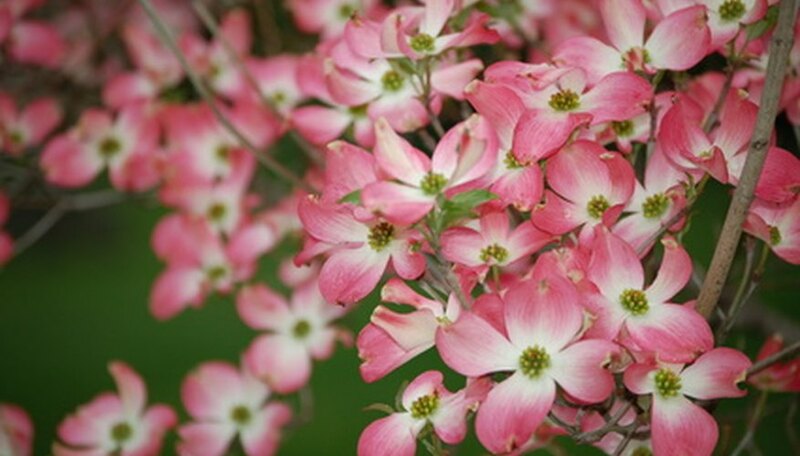 Fertilize dogwoods three times a year for the first three to five years after being planted, according to the Ms. Grow-It-All website. Fertilize in March, May and August. Trees in USDA hardiness zones 6 and 7 only need two feedings a year, in March or April and again in July. The dogwood tree thrives in most parts of the country, doing best in USDA hardiness zones 5 through 8. For dogwood trees not yet planted in the ground, give them a head start on feeding by planting them in soil mixed with compost and manure. Water well and top with leaf mulch. The dogwood is susceptible to various pests and disease, including twig borers, which feed on the tips of young twigs; club gall; and dogwood anthracnose. To prevent disease keep the tree well watered and prune away diseased twigs or branches as soon as they appear to prevent the problem from spreading. Dogwood trees don't like salt and generally don't do well in coastal regions. Thomas K. Arnold is publisher and editorial director of "Home Media Magazine" and a regular contributor to "Variety." He is a former editorial writer for U-T San Diego. He also has written for "San Diego Magazine," "USA Today" and the Copley News Service. Arnold attended San Diego State University.